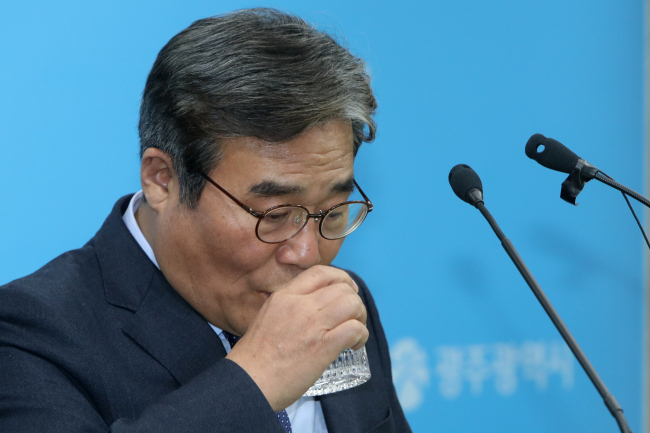 A joint venture plan involving a local government and Hyundai Motor to build a manufacturing plant in Gwangju for sake of reinvigorating the local economy went adrift Thursday as the sides failed to narrow their differences at the last minute. Gwangju’s city government on Wednesday demanded Hyundai Motor remove a condition that wage renegotiations be suspended for the first five years. Later in the evening, Hyundai Motor rejected the demand, saying that the revised proposal no longer makes its investment profitable. “It is difficult to accept the revised plan, in the aspect of investment feasibility,” it said in a statement. Hyundai Motor, which had considered the issue settled, criticized Gwangju for going back on its previous agreement to suspend the wage renegotiations, and questioned whether the city really held full authority to negotiate with it. A quadripartite body, consisted of labor representatives, the city’s employers’ association, civic representatives and the local government, is Hyundai’s legal counterpart in the negotiation. To speed up the process, Gwangju government had said it had been given full authority to proceed with the negotiations on the body’s behalf. But in the face of labor opposing the condition of suspending wage negotiations, the Gwangju government convened the quadripartite body again to discuss the matter. The so-called Gwangju-type job creation project mainly involves hiring more workers at half the wage Hyundai’s workers receive at other plants, with the Gwangju government providing lucrative tax incentives to investors and subsidies to the workers. The project has been drawing attention from political circles and the Moon Jae-in administration, which has set job creation as a top priority. The joint venture in Gwangju aims to create 12,000 new jobs. Hyundai and Gwangju were supposed to hold an agreement ceremony Thursday, with President Moon Jae-in attending. Expressing disappointment, however, Cheong Wa Dae said it would closely monitor the situation. Hyundai Motor rejecting the revised proposal puts an end to a monthslong negotiation, said Hong Young-pyo, floor leader of the ruling Democratic Party of Korea, in an apparent move to pressure the carmaker and Gwangju. “We still have hopes for the Gwangju project, but will look for alternatives,” he said. With the political pressure mounting, the Gwangju government said it hopes to conclude the deal within this month, saying it isn’t over yet. Most of the plan had been agreed but a deeply rooted confrontation between Hyundai and its unionized workers had made the part concerning wages difficult to keep, said Vice Mayor Lee Byeong-hoon. “If had only Gwangju City (been at the negotiation table) it would already be a done deal, but we won’t let the flames of hope go,” he said. Vice Mayor Lee Byeong-hoon said any discussion was legally required to go through the quadripartite body under the law. Some experts said Hyundai could simply end up losing money on the investment if it has to accept wage negotiation demands, not to mention the risk of facing threats from its own labor force. Unionized workers at Hyundai’s plants in Ulsan, Asan in South Chungcheong Province, and Jeonju in North Jeolla Province have opposed the plan, citing fears it would lower the level of their average pay. Hyundai Motor, meanwhile, said it would continue negotiation with Gwangju, without saying when it would return to negotiating table.